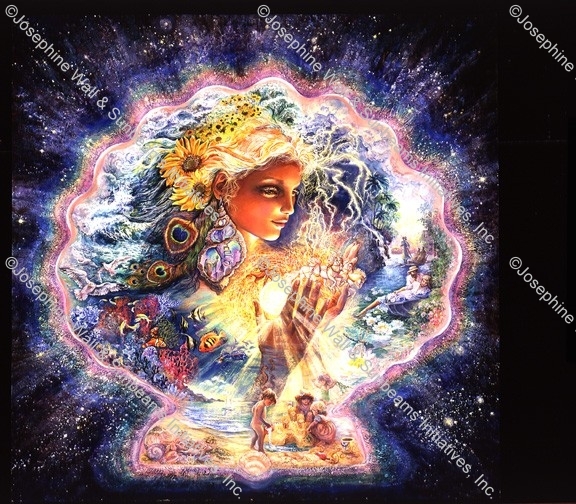 The goddess, her golden hair adorned with sunflowers, is holding Helios, the Greek sun god, who traversed the sky from east to west in his chariot of the sun each day, bringing warmth and light to the Earth. King Neptune can be seen ascending the spiral staircase in her shell earing. Lightning flashes across the sky as a dramatic introduction to a summer storm, in contrast to tranquil days spent by lovers at the river's edge or children building sandcastles on the beach.